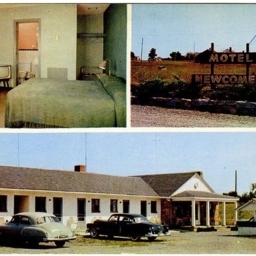 Color postcard with a picture of the Motel Newcomer, its welcome sign, and an interior picture of a room. The motel is located near Strasburg Virginia in the area of Fisher's Hill. As of 2018 it was still in operation as a Budget Inn. 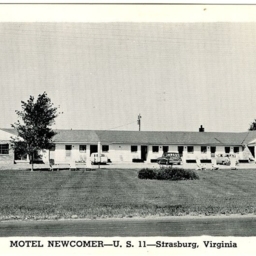 Postcard with a picture of the Motel Newcomer, its welcome sign, and an interior picture of a room located near Strasburg Virginia. It is today a Budget Inn.